If you dream of a fairy-tale destination wedding away from the hustle-bustle Wits End’s wedding venue, and adjacent chapel is the ideal setting. 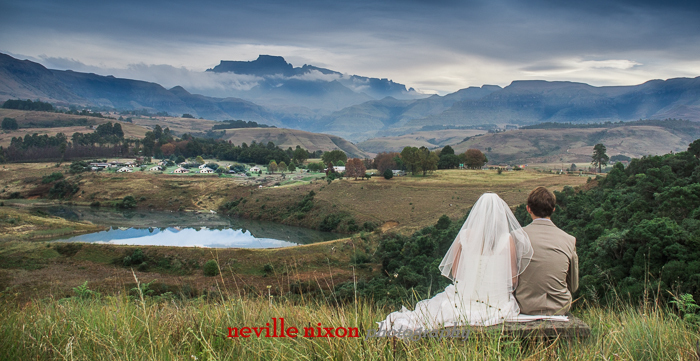 We are fast becoming the wedding venue of choice in the Central Drakensberg as we not only offer the functions centre, chapel and accommodation all on one site but also offer many of the add on’s as part of the package. In fact, for your dream wedding, all you need to add is your personalized items and you and your guests. Situated in one of the most beautiful areas of South Africa in the heart of the Champagne Valley, Central Drakensberg with breathtaking mountain views, our purpose built reception venue & on-site chapel each can seat up to 150 guests with on-site accommodation for 60 in 9 fully equipped chalets. The venue is reminiscent of a spacious stone farmhouse, with soaring ceilings and exposed beams, flowing onto a wide veranda overlooking a tranquil lake and acres of unspoiled rolling mountain grasslands. A grand stone fireplace means that a cozy ” winter wonderland” wedding is also a lovely possibility. The chapel with its handcrafted doors made of local pin oak, and framed by 2 reclaimed stain glass windows, has a large picture window overlooking our lake and the hills beyond. The “lapha” at the rock pool area offers an ideal venue for a pre-wedding gathering. There is a large built-in braai, a wood-fired pizza oven as well as an attached service kitchen for your exclusive use and convenience. As you will no doubt now have realised there is an abundance of excellent photo opportunities in this exquisite part of the world, both at Wits End, and in the surrounding areas, which means that as an added bonus there is no need to waste time travelling for your photos. Our wedding package includes: the venue for up to 150 guests, standard tables and chairs with white tablecloths and white chair covers, crockery and cutlery, wine and champagne glasses, venue draping, background music, a PA system, self-service bar with barman, plus 2 nights’ accommodation for up to 61 guests. In fact, all that you need to do is add your personalized touches which we will be more than happy to help you source and arrange locally. (Items not included: extra draping, non-standard tables and chairs, table overlays, chair tie backs, table decorations and flowers, under plates, DJ & photographer). With regards to the catering, we have our own specialized wedding caterers who will create a menu to meet your specific requirement. You can either choose whatever options suit you from our list of suggestions or design your own menu. We also allow you to use your own professional caterer subject to our approval. We provide a list of other vendors, including personalized decor, flowers, photographers, hairdresser, DJ, wedding cake etc. Chapel hire or outdoor wedding set up – R 2,500.00. This includes seating with chair covers for up to 150 guests or if you choose an outdoor ceremony covered straw bales. The chapel will be a back up if the weather turns bad. Weddings exceeding 56 guests R 46,000.00 for the 9 chalets sleeping 56 guests.R 821.00 pp for the week end. We can add an extra 5 beds for free. Weddings For 48 or less guests R 37520.00 for 7 chalets sleeping 48 guests-(chalets sleep 44 + 4 extra beds for free). R853.00 pp per night for the week end based on 48 guests sleeping at Wits End.